As you can see, this is based upon the Kung Fu Panda movies but it also takes a page from Konami’s old Boxing Mania with different hit sensors for the player to punch/slap on their quest to win tickets. 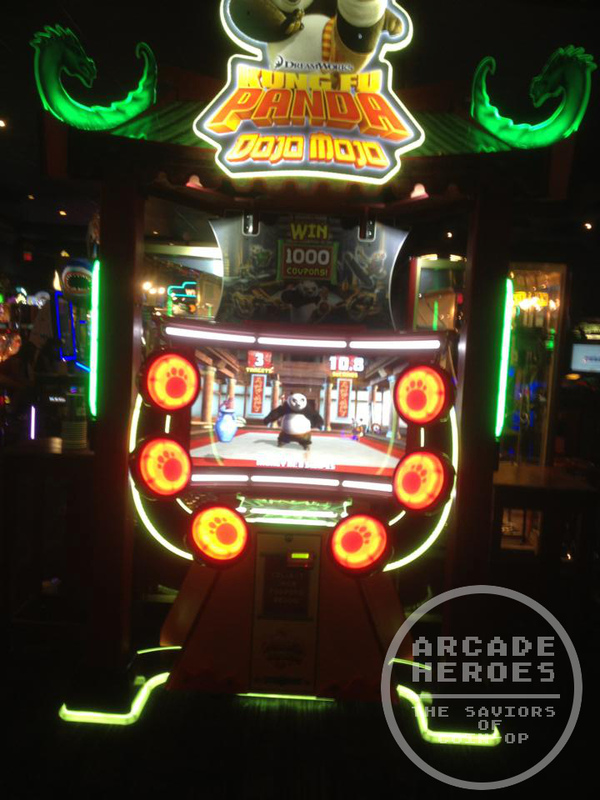 This is likely from a location test at a Dave & Busters. According to Michael who sent this picture in: “It reminds me of DDR but with your hands or like Lai Games Speed of Light. Game play is simple, just break the targets coming towards KF panda by hitting the low/medium/high pads/buttons on the left and right”. This game will be at IAAPA 2014 and most likely it will be available shortly for the market after that. This is making me think of the other game ‘fighting mania : fist of the North star’ with how the punch pads are laid out and the theme Kung fu panda. I’m surprised another version of that hasn’t come along in a while since the early 2000 but I guess since the wii came out they thought it as pointless. The one thing that the arcade can do is have force feed back punch when you actually punch a trigger like a punch pad which the wii and other sensor controls can’t do other that vibrate or gush of wind.